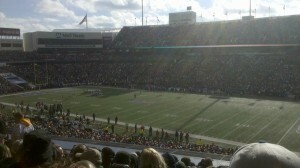 The Buffalo Bills lost to the Pittsburgh Steelers 16-13 in overtime. Pittsburgh came into this afternoon’s game as a 7 point favorite over the much maligned Bills. Buffalo had their fair share a chances to win the game, including a dropped touchdown in OT by Stevie Johnson who has since used twitter to blame a higher power for his misfortune. Today’s loss ends the Bills two game winning streak and helps the Steelers keep pace with the Baltimore Ravens in the AFC North. Of greater concern to me is wondering what the current state of mind must be like for the city and fans of Buffalo after yet another devastating loss. Like most of the country, Buffalo has been hit hard by our most recent economic downturn. Fans in upstate New York continue to turn to their beloved Bills in search of an opportunity to escape from the daily doldrums of financial insecurity. As far as I can tell, Buffalo continues to fill up Ralph Wilson Stadium and care about a team that hasn’t been a threat in the AFC East since the days of Jim Kelly, Andre Reed, Bruce Smith, and Thurman Thomas. And how is the organization repaying their loyal fans? By moving games to Toronto….Canada. I understand that the NFL is looking to expand into new markets and owners are driven to increase revenue by building stadiums with more luxury boxes. But the Bills organization owes it to their city and fans to put a better product on the field and help keep the team in Buffalo. If they go, what happens to the city? I’m on your side Bills fans. Keep showing up to games and here’s hoping your team remains competitive this year and beyond (especially against the Jets). Share your views!